The Wolf Among Us is an adventure game from TellTale Games, the minds behind the Walking dead game... the good one. I'd played the first chapter and a half of Walkingdead, but never really got into it. I liked it. I thought it was good, but I didn't complete it (I still haven't). However when I saw The Wold Among us the whole idea just instantly clicked. The game is based on the comic series 'Fables' in which a community of fairytale characters live in New York under the community title of Fabletown. at the beginning it shows the Big Bad Wolf (Bigby Wolf) as the sheriff who keeps the people safe. 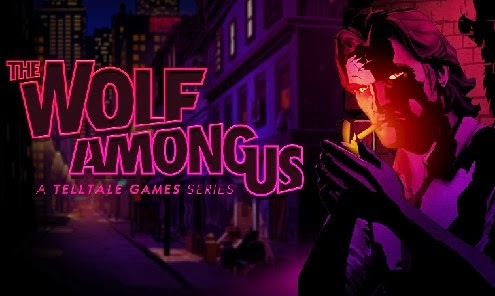 The Wolf Among us is a prequel to the comic series, following Bigby as he tries to solve the murder of a fable in fable town. It's a really interesting story that takes a lot of twists and turns, at least in the first two chapters. Parts three, Four and Five aren't out yet. That's episodic gaming for you I suppose. I absolutely loved Part 1, it kept throwing me for a loop, every time I thought I knew what was up I was wrong. It just worked really well and was written really well. Part two however wasn't nearly as good. Maybe it was my play style, maybe it was because I missed something, but I felt like it didn't have nearly as much awesome as the first one, nor did I feel it was as long (I completed it in an hour and a half) but that's not going to stop me playing the next one. I want to know who did the killings. It shows a darker side of fairytales, shows how they can fall through the cracks and how bureaucracy can screw over even near immortal fables when it wants to. It's a great game and I highly recommend you play it (360, PS3 or steam).